Persona profiles come from user experience, human-centered design, and design thinking. They put a name and a face on stakeholder groups. They are fictionalized characterizations to help participants better empathize and understand the stakeholder groups. A good persona profile template looks like a dossier: it has a name, the customer group they belong to, likes, dislikes, career goals, frustrations, feelings towards your organization, needs that your organization can help provide for, preferred communications channels, and a memorable quote. A great way to facilitate developing persona profiles is to use open space. As a large group, brainstorm a list of stakeholder groups, then select the top stakeholder groups to explore in more detail. Each top stakeholder group gets its own persona profile template. From there, participants are free to work on the persona or personas they have the most energy around. Don't dictate who has to develop which profile. And, if someone wants to leave a persona midway and join development of another, that's OK. The principles of open space say, whoever shows up are the right people, whatever conversations are had are the right ones to have, and whenever a conversation starts and ends is the right time for it to start and end. And there's one law: the law of two feet. That means, if a conversation isn't working for you, you can leave it and join another. Share a completed mock-up example so participants better understand what's expected. Give participants about an hour to develop the persona profiles. 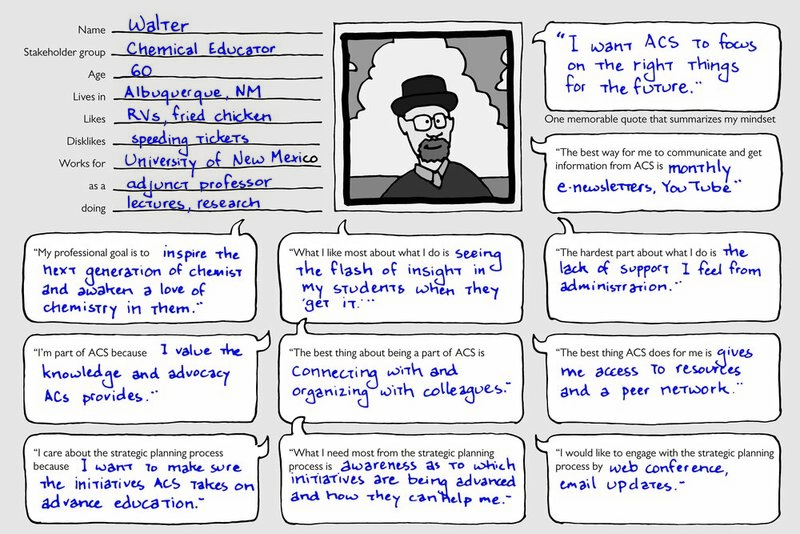 Then, invite participants to share the persona profiles they'd developed back to the large group. Graphic record highlights from that debrief. I first saw persona profiles used by Dean Meyers in September 2013. Here's a link to a free persona profile template. Morning Percolations comes from Elise Yanker of Collaborative Consulting Inc. It's a great framing activity that gives participants time and space to empty their mental backpacks and be fully present and engaged for the day. Morning Percolations typically begin the morning of the second day of a multi-day event and repeat every following morning. You might begin by saying, "We had some good conversations yesterday. Last night and this morning, you may have been thinking about what we talked about. Let's begin today with an open conversation. Please share anything that's on your mind relevant to what you heard yesterday. What's percolating up for you?" Morning Percolations only need a timebox (typically 30 - 45 minutes) and good open-ended questions. Resist the urge to answer questions or resolve doubts or concerns. Encourage participants to likewise simply listen to each other. 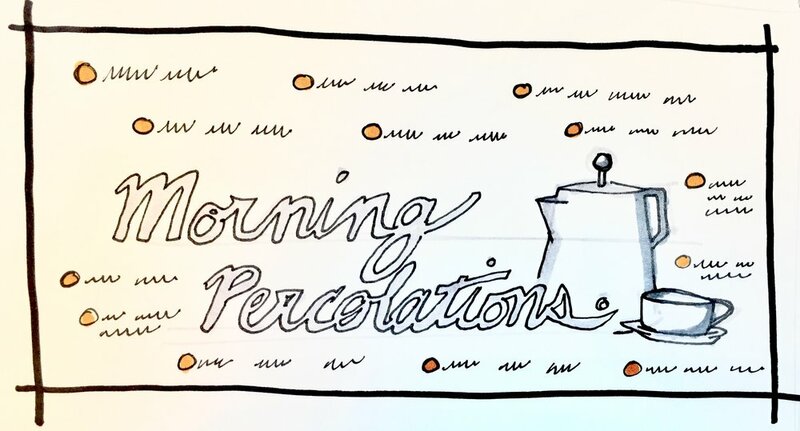 You don't have to graphic record Morning Percolations, but it adds to the experience by acknowledging what participants share. Use a loose layout, like a word cloud, that supports the free-form nature of the conversation. Virtual reality offers a nearly limitless canvas for exploring ideas. Here are some facilitation design patterns captured in VR. Work in progress, feedback welcomed! 1. Technique: Markers, paper handling, color use, lettering, drawing, forms, levels of information, listening for synthesis. 2. Models, Methods, and Tools: visual energizers and icebreakers, meeting principles and ground rules, and visual tools for brainstorming ideas, comparing ideas, and collaboratively deciding the way forward. 3. Experiential Practice: hands-on exercises with an experienced graphic facilitator. The visual thinker, the whiteboard salesman, the data visualizer, or anyone that sits in the intersection of visuals and helping others solve problems. This hands-on, practice-driven workshop will give you everything you need to graphically facilitate groups through the toughest challenges. Somewhere in between I Like, I Wish, What If feedback and One Word Feedback is One Breath Feedback: "In one breath, share any feedback you have on what you heard." 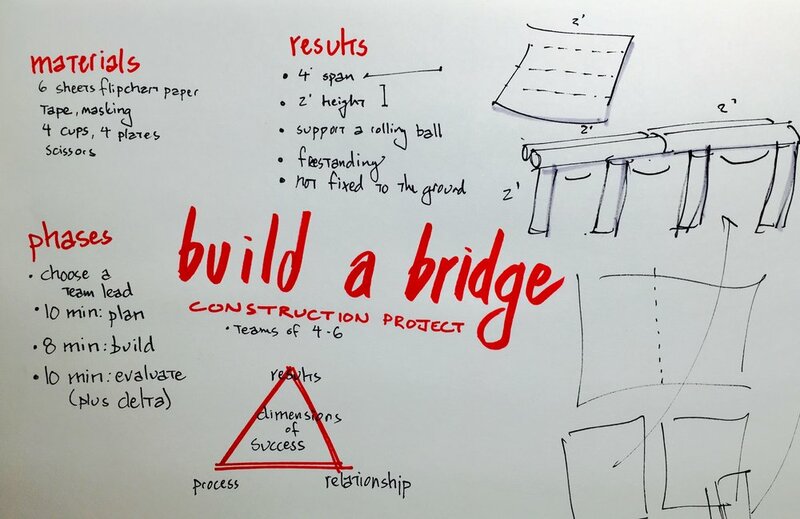 Build a Bridge comes from Interaction Associates. It's an energizer and team building activity that requires no special materials. It can teach the same lessons of prototyping and integration as the Marshmallow Challenge, but can be done on the fly without the need to bring marshmallows and spaghetti with you. Build a Bridge also brings awareness to group dynamics and interpersonal conflicts against a model of Results, Process, and Relationships. The object is to use paper and tape to build a free-standing, four-foot long, two-foot tall bridge capable of supporting the weight of a rolling ball of paper. Break participants into groups, and give them 10 min to plan and 8 minutes to build. Tell them that as they plan, they must come to consensus on a design. After the groups have built their bridges, test them with a rolling ball of tape and paper. Then, ask open ended questions to draw people out and help them listen for a 10 minute debrief of the activity. Success in results means the bridge was able to support the weight of the rolling ball. Success in process means that the approach and design was achieved by drawing on the best ideas of all the participants. Success in relationships means that there was full participation, mutual understanding, and inclusive decisions. Ask the groups how they did in each of these three areas. Build a Bridge can quickly recreate powerful group dynamics and provide participants with an objective lens to judge their own strengths and weaknesses. Most groups make results their top priority, followed by process, then relationships. This exercise highlights the need to give all three equal importance. The three-part model of results, relationships, and process is a good principle to refer back to over the course of your event. "How Do You Keep Meetings Moving?" Participants will often ask about how they can keep their own meetings going after the facilitator has left. There are great resources out there. I usually recommend Sam Kaner's "Facilitator's Guide to Participatory Decision Making," "How to Make Meetings Work" by Michael Doyle and David Straus, and "How to Make Collaboration Work" by David Straus. But if someone just wants a quick fix, I share this story from "Switch" by Chip and Dan Heath. General William "Gus" Pagonis led the logistics operation for the Gulf War under President George H. W. Bush. Pagonis was responsible for moving 550,000 troops halfway around the world, along with all of their equipment. His team made the arrangements to serve 122 million meals, pump 1.3 billion gallons of fuel, and deliver 32,000 tons of mail. Even a Wal-Mart executive would get spooked thinking about this. Needless to say, clear and efficient communication was essential. Every morning, General Pagonis held a meeting that started at 8 a.m. and ended at 8:30. No great innovation there, but Pagonis made two changes to the routine. First, he allowed anyone to attend (and he required that at least one representative from each functional group be present). That way, he could ensure a free and open exchange of information across the organization. Second, he required everyone to stand up during the whole meeting. "Early on, I discovered that making people stand up keeps the ball moving at a quicker pace. People speak their piece and then quickly yield the floor to the next person. On the rare occasion that someone starts to get long-winded or wax philosophic, an unmistakable kind of body language begins to sweep through the crowd. People shift from foot to foot, fidget, look at their watches - and pretty quickly, the conversation comes back into focus .... I can't recall the last time I had to crack the whip. The peer group has great power." A group process is like a marathon. At the beginning, there's anticipation, excitement, energy, and a little fear. In the middle, there's exhaustion, fatigue, and doubt. Some may wonder how they'll ever make it to the end. At the finish, there's exhilaration and a sense of accomplishment. People enter into a group process at different places. At a facilitated meeting, some participants may have already been dealing with the subject for weeks, while for others, it's the first time they're hearing about it. Those who have been a part of the process for sometime may have forgotten the fear and pain from earlier. The principle of the marathon reminds participants that others may need time to process what they're now a part of. I first heard the principle of the marathon from Nancy Reuscher. Following the logical thread of a group process isn't easy. It's tough for participants to see how one facilitated activity will lead to another, and how the whole event will eventually get them where they want to be. Agendas alone fall short, especially if there are multiple, distinct objectives. One way to help the group see the process is to immerse them in it. Arrange the templates, charts, chairs, and tables around the room so that the activities flow from one chart to the next, following the agenda. Whether the spaces are visual templates, blank charts for graphic recording, or stations for group or individual activities, the purpose is to help the group visualize how the day will unfold sequentially. The room becomes an assembly line for ideas. Introduce the process just like you would walk through an agenda: walk through the room, giving a light touch to each activity. Give a timeframe for each activity. Don't forget to mention where lunch, breaks, and other invisibles will fit in. Emphasize the logic of how ideas will flow from one activity to the next. Using the room as the agenda helps big picture people see how it all fits together. It reassures detail people and process people that time, thought, and planning have gone into this. And it surfaces any challenges to the process early, so that participants can empty their backpacks and be more fully engaged. I've watched many graphic facilitators use this method. It's most directly inspired by the Grove Consultants' design pattern of Rooms as Memory Theaters. I've always been drawn to new and different ways that groups can collaborate to build something that can help them better understand their organization and culture, whether it's kinesthetic modeling or abstract painting. Along those lines, I'd like to introduce you to Kevin Reese, an innovative artist with something exciting to offer. Kevin is a "collaborative artist" who works with arts centers, schools, and whole communities throughout the country to create “moving” works of art — high flying, colorful mobiles. In the past 15 years, Kevin's SchoolSculptures has created over 170 installations in 30 states. This summer, he was the artist in residence at the IFVP conference and, with the participants, created a stunning mobile during the conference. From the moment he stepped up to introduce the concept to the final reveal and every creative-energy-infused moment in between, his passion and artistry truly created the sense of community we were hoping to drive. He is now launching TeamSculptures to offer a corporate team-building experience like no other-- a week-long residency where Kevin becomes your corporate artist-in-residence. - Design and create a large-scale mobile that represents the goals and aspirations of your company. - Install the mobile in your lobby, lunchroom, or conference room for daily inspiration. - Discover your visioning strengths through a new medium. - Tackle novel challenges, rather than solve routine problems. - Imagine multiple possibilities as you work toward a common goal. - Find inspiration and motivation from an artist of singular passion and unique skill. Kevin is looking for beta sites to test and develop his residency this spring. His fee will be significantly discounted, so get in on the ground floor of what will no doubt be a popular national offering. If you're interested, Kevin will personally visit your company to discuss how this residency can work for you. Check out his website: www.teamsculptures.com. You can also contact him directly at SchoolSculptures@aol.com. Here's one that I'd forgotten about until seeing it again last week from a (non-visual) facilitator. It's a super-fast energizer that underscores the importance of perspective. Ask participants to stand and point at the ceiling with their hands above their heads. Ask them to begin tracing a circle in a clockwise direction. Slowly, have them move their hands downwards below eye level. Keep the circle going. The effect is that the direction of the circle has changed to counter-clockwise. In fact, the direction of the circle hasn't changed: what's changed one's the perspective on the circle. This is a quick way to inject a little energy and remind participants of the Principle of the Beachball. The principle of the beachball is one of the most powerful principles on perspective taking that you can bring into a facilitation. "Imagine that there was a beachball in the center of the room. Based on my perspective, my senses, my experience, my expertise, everything that I am is telling me that this beachball is red. So what’s the first thing that someone on the other side of the room thinks when they hear me say that? That I’m wrong! How could that possibly be? From their perspective, the beachball is clearly blue. "The principle of the beachball tells us to hold the space for all perspectives. No one can see an entire beachball from one perspective. It’s impossible. What we’re going to be working on today will be a lot more ambiguous than a beachball. No one will have the one perfect perspective. There’s no such thing. Trust in your colleagues, that when they share what they share, they’re giving you a glimpse of their perspective. And challenge yourself to say, “How might ALL these perspectives be true?” By bringing in all perspectives, we get a clearer picture of the whole." I’ve heard the principle of the beachball used by many facilitators, including Elise Yanker and Nancy Reuscher, so I’m not sure where it originally came from. I use it so often that I actually carry a little inflatable beachball with me to help make the point. The little beachball also serves as a pretty good talking stick. The principle of the Balcony and the Dancefloor comes from Ron Heifetz. It's easy for participants to get tunnel vision on their perspectives, losing focus on what else is happening in the room. By introducing the principle of the Balcony and the Dancefloor, you (or anyone) can call a balcony moment to pause the conversation and shed light on the human behaviors. Explain that the Dancefloor represents the content of the conversation we're having. It's WHAT we're talking about. The Balcony, by contrast, is a place from which to make objective observations about the human dynamics. It's HOW we're engaging with each other. Ask, "What are people noticing about what's happening in the room? What would you say the dynamic is? How are people showing up? What could we do to make this conversation more inclusive of others' views?" The Balcony and the Dancefloor is one of the best ways to keep emotions cool and minds open. One of the most basic takeaways from a facilitated session is an action plan. This can be as simple as a bulleted list on a flipchart synthesizing all the decisions from the event. For higher engagement and accountability, you can put recording the actions in the hands of the participants. In both cases, participants use the left side to brainstorm out their own goals. Then, they break down those goals into actions and give themselves due dates for achieving the actions. Checking in with an assigned accountability partner or peer coach is often the first action. Ever heard comments like, "This detail is too much for me," or "Just tell me what to do," or " How do we KNOW this is the right way to go," or "Have we explored all the options?" That's individuals identifying their own strengths and weaknesses in process thinking. If you ask participants upfront to identify what part of the process they prefer to be in, you'll do a lot to keep them engaged. This model blends the ideas of Interaction Associates, the Inscape Team Dimensons Profile, and Sam Kaner's model of Divergence/Convergence. Explain that there are those people that like to Open: brainstorm, explore options, and bring in new ideas. There are those that like to Refine: assess feasibility, value, and impact, and combine, critique, challenge, or eliminate ideas. There are those that like to Close: decide, assign, plan, execute, and check the box. There's huge overlap with this model and the Myers-Briggs, the Team Dimensions Profile, Social Styles, and other personality assessments. What works about this model is that it also maps back to the flow of ideas of a facilitated session. In this way, participants can be aware in advance of the points in the agenda where they may be at their best, and where they may be out of preference. The Marshmallow Challenge is one of my favorite activities. Since learning about it at IFVP 2012 from a former Disney trainer, I've seen it help dozens of groups realize the importance of team dynamics, fast failure, iterations, and facilitation. Unfortunately, it requires special materials (marshmallows and spaghetti), which means planning and preparation. It can't be done on the fly. Another activity that CAN be done using standard facilitation materials is "Build a Bridge" from Interaction Associates. Groups of four to six participants must build a freestanding bridge that's four feet long and stands two feet off the ground. It must support a grapefruit-size ball of paper and tape as it's rolled along the span. The bridge must be freestanding, not connected to any other object. It must also be movable. Any number of concepts can be demonstrated or drawn out of this activity, including those from the Marshmallow Challenge. A powerful concept are Interaction Associates' "Dimensions of Success," which show Results, Process, and Relationships. How did the groups do on each of the dimensions? What happens if one is missing? Ideally, "Building a Bridge" will create team dynamics in the safe space of your event that participants can draw powerful lessons from. From "The Facilitator's Guide to Participatory Decision-Making." Energizers intentionally disrupt participants' mental modes and patterns. They break the ice at the beginning of an event. They move learning modes from passive listening to active engagement. They can safely provide an opportunity to model good group dynamics, such as withholding judgment and giving constructive feedback. And they can shift individuals' focus between self-reflection and group participation. In all cases, energizers should end with a group reflection, giving participants the opportunity to relate lessons learned back to the overall purpose of the event. Energizers for the sake of energizers may be fun and build esprit de corps, but alone don't advance the purpose of the event. The best energizers serve as a model and microcosm for the overall event. Here's a collection of some visual energizers. Participants collectively draw one picture or write one word using a single marker tethered by a number of strings. Models accepting the facilitative process, group dynamics, leader/follower roles, intuition, and the learning arc. Participants contribute their own repeating abstract patterns to an overall composition. Models reflection, meditation, individual mindfulness, and group processes. Participants draw simple line self-portraits. Portraits can either be realistic or metaphoric. Self-portraits model withholding judgment, supportive feedback, individual perspectives, and team diversity. Participants make up stories to explain simple, abstract drawings. Droodles model creative thinking, abstraction, story telling, and celebration. A visual "telephone game," where participants alternatively draw and caption in a series. Models communications, systems thinking, and power dynamics. Models story telling, constructive feedback, and group diversity. Participants must fit together a large puzzle and color it so that the elements do not mismatch. Models systems thinking, communications, production blocking, leader/follower relationships, supply chain thinking. Participants draw themselves as a superhero, complete with costume, backstory, list of superpowers, weaknesses, sidekick, and villain. Be sure to include male and female versions. This idea comes from Trent Wakenight, Marker Ninja. Models self awareness, leadership styles, team diversity, and story telling. Captures participants ideas and input on perfectly balanced pieces of moving art. Collaborative Communities - Kinetic Sculpture facilitation at International Forum of Visual Practitioners 2016 in Washington DC. Facilitated by Brian Tarallo, Heather Martinez, Trent Wakenight, Lauren Green, and Dean Meyers. Designed by Kevin Reese. Models diversity, future visioning, collaboration, and culture.